The Commissions addon includes support for paying out commissions instantly when it is used with the PayPal Adaptive Payments payment gateway. Enter your API keys for your PayPal application here. If you have Test Mode (in Downloads > Settings > General) enabled, you will need to use API keys from http://developer.paypal.com, otherwise use the API keys from your PayPal account. You will only enter one receiver here because the Commissions extension automatically adjusts it at the time of purchase and adds the vendor's email as a receiver with the appropriate percentage. 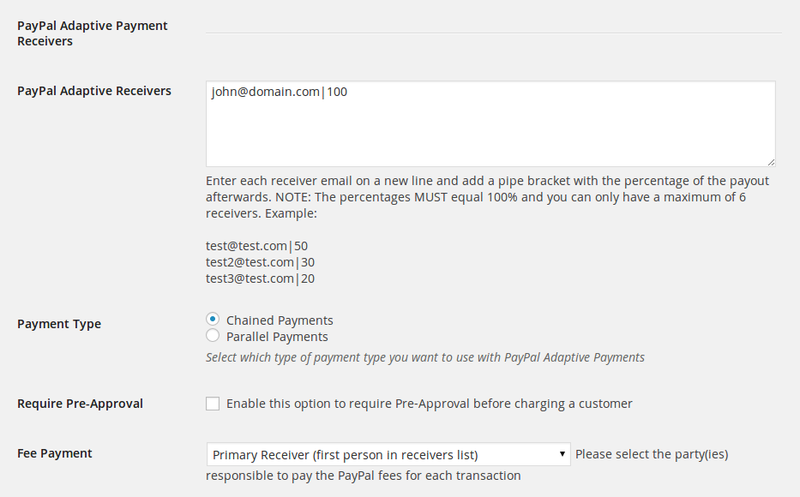 The Payment Type can be either Chained or Parallel. Now that PayPal Adaptive Payments is configured, you will need to configure the commission tracking options for each product. Consult the main Commissions documentation for further instructions if necessary. In order for commissions to be paid instantly, the purchase must be processed through PayPal Adaptive Payments. Purchases made through other payment gateways will not be paid out instantly. PayPal Adaptive Payments can pay a maximum of 6 vendors per purchase. If a customer attempts to purchase items from more than 6 unique vendors, the purchase will fail. The PayPal Adaptive Payments extension is required.